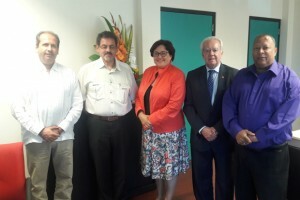 WILLEMSTAD – Colombian ranchers paid a visit to the new Minister of Public Health, Environment and Nature, Suzanne Camelia-Römer to exchange ideas about the import of fresh meat to the island. This topic has been a hot issue recently with all the inspections taking place by the multidisciplinary team consisting of the Inspectorate of the Ministry of Economic Development, Police, Health Department and other government entities. The ranchers gave information to the Minister about their meat products, their norms on quality and freshness which apply in their country. They also indicated their interests to invest in a distribution center here on the island. This center will not only distribute to Curaçao but also to neighboring islands. The ranchers, Juan Pablo Gomez and Victor Montejo represent the company Frigorifiko Guadalupe in Colombia. Minister Camelia-Römer stated that she is open for all initiatives that can guarantee high-quality products that are affordable and healthy for the people of the island. The delegation also visited the veterinary service which is part of the Ministry of Public Health, Environment and Nature where they received information on what the norms are here in Curaçao on how to deal with meat products.